It’s no secret that we absolutely LOVE cheese in our house. And we don’t discriminate either. Whether it’s sharp cheese, soft cheese, or even “stinky” cheese…there’s always a place for it in our kitchen. That’s why I was so excited when La Bonne Vie asked if they could send me some cheese to develop a recipe with (um, ya!). La Bonne Vie, which translates into “The Good Life,” offers a variety of both Brie and goat cheeses…two of our favorites. To find out where you can purchase their products in your area just enter your zip code on their “store locator” page. Then after you get a hold of their cheese we’d love for you to try out some of the “real food” recipes below. And in my opinion the “Grilled Brie and Apple Sandwich” would be fabulous with the addition of some leftover turkey on it (hint, hint). A big thank you to La Bonne Vie for sponsoring this post today! In a small pot combine diced apple, maple syrup, vinegar, powdered ginger, and 2 tablespoons water. Set over high heat and once the mixture comes to a boil simmer on low heat for 5 minutes. Drain apples (discard liquid) and mash with the back of a fork to form a coarse paste. This is your "shortcut" apple chutney. Spread the chutney over two slices of the bread. Top with a layer of Brie and turkey (if using). Add remaining two bread slices over top. Either in a medium-sized saute pan over medium heat or on a griddle set to 375 degrees F add two generous pats of butter. Once the butter melts place the sandwich in the pan/griddle and cook on each side for 2 to 3 minutes or until golden brown. Slice and serve warm. Heat non-stick skillet over medium heat. Add butter. While butter melts, crack eggs into a large bowl and whisk for 1 minute. Add chèvre and milk and then whisk to combine. Pour egg mixture into skillet and stir, scraping pan continuously. When eggs are almost done, but still slightly runny, add chives. Serve hot and garnish with chives. Chop potatoes, parsnips and celery root into 1/2 inch pieces. Boil until tender and mash. Meanwhile, cut leeks in half lengthwise and rinse under cold water to remove any soil, then slice into thin half rounds. In a sauté pan over medium low heat, melt the butter and then add the leeks and garlic. Cook until the leeks begin to caramelize and turn brown, being carful not to burn the garlic. In a casserole dish, combine the vegetable mixture, leeks, cream, and Brie. Bake uncovered at 425 degrees F for 20 - 30 minutes until heated through and browned on top. Previous Post: « Cookbook Review: 8 of Our Favorites! Mmmmm, this looks delicious! Is this brand of cheese organic? I love your homepage, and I understand that you need to create some money. But I recently noticed, that the quality of your page is going somewhat down by incorporating your sponsors a little bit too much (posting their recipes, referring single parents to meal planners, etc.). I share the love for cheese with you, but I guess we agree that La Bonne Vie Cheese is certainly not the best brie available. Also, the company gives quite sparse information about how and where the cheese is produced (Are GMO-enzymes used? Are plant derived enzymes used? Where do they get the milk from: local? Organic? With Growth hormones?). I just don’t understand why you would enforce the cheese besides the fact that they are sponsoring you. Also, does Brie really need a recipe? IMHO it is best with just some plain high-quality white bread/baguette. Critical Reader – I appreciate your feedback, but sponsors are what help us keep this blog going at no cost to our readers. As you may know we have an entire team behind the scenes that carefully answers every single question both on the blog and on facebook. There’s a lot of work that goes into each and everything we do and sponsor “intros” are the way we’ve decided to structure things at this time, but I will certainly take your feedback to heart as we make decisions going forward. Also, the requirement for our sponsors is that they follow our real food rules (https://www.100daysofrealfood.com/real-food-defined-a-k-a-the-rules/) and while we certainly recommend organic it is not an official “rule.” And believe it or not we’ve actually turned away many potential sponsors because they are offering something that does not meet our written guidelines. Regarding La Bonne Vie, I purchased their cheese on my own and enjoyed it before they even contacted me…so I was personally already a fan. Our family tries to do organic as much as possible, but it’s not feasible to go that route 100% of time (due to product availability). And we actually have a lot of first-time cooks who read this blog. One person (on FB) said she’d never even had Brie before. So while it may seem like common sense to some we do have a wide range of readers here…plus even the most seasoned cook can get burnt out and need ideas. I hope that clears things up for you. I’ve put a great deal of work into this blog and care an awful lot about it. Lisa — I just wanted to encourage you as it’s not fun to hear negative comments. No one likes to hear a ton of commercials, but you have done a good job using sponsors so that you can afford to take the time to provide this helpful web site, and unlike other bloggers, you have chosen sponsors whose products are an actual help to your readers. Thank you for doing that. And thinking up a recipe can be hard sometimes — using a sponsor’s product is a fine way for you to get inspiration for something new! We understand! And we appreciate all the work you put into this site. Your recipes for brie sound delicious. I am a fairly experienced home cook but do not know what to do with brie. As already said, i think you are doing a great job with your blog and it is obvious that you care about it a lot. I am also aware, that running a blog like that is a lot of work. I therefore fully understand your need for sponsors. BUT: you might loose both your independence and credibility if you are too aggressively promoting products which are in some ways contradictory to your own believes. I am a single parent, hobby cook, food scientist, and plant biologist. That combination makes me receive tons of questions about anything concerning food, cooking and how to feed kids (although my daughter is the worst example ever as she would always opt for McDonalds & Co over home-cooking). I used to refer friends to your site to get a basic idea about cutting out convenience food and opting for higher quality product without loosing a sense of that we do not all have the budgets for 100 % organic, 100 % natural, 100 % whatever. However, i recently stopped doing so, because I noticed too much product placement, product reviews, webinars, pushing for meal plan services, etc. Obviously, La Bonne Vie’s cheese would not be your first choice. Why did I mention GMOs? Firstly, because a lot of your readers care about it. Secondly, you repeatedly recommend avoiding GMOs. I would have expected you to at least research and inform your readers about possible GMO content in La Bonne Vie’s cheese. The company’s homepage is not very informative and does not give any information about where they receive their milk from and also what kind of enzyme they use for cheese production. Calf rennet, microbial rennet, plant rennet? Microbial rennet is one of the oldest and widest used GMO-derived products in the US (although it has never received as much public attention as its bt/roundup counterparts in the plant world). I actually knew the company and some of its products before I read your post. I was once looking for a cheeper and more local alternative for the imported French Brie I used to buy from a local wine&cheese shop and stumbled over La Bonne Vie. My personal opinion (which nobody has to share): not worth the money, only slightly cheeper than imported, ‘real’ cheese (the one that is cut freshly from a large loaf) but far inferior in terms of taste. For plain bread & cheese I would go for the imported non-prepacked ones, for cooking I would use a cheaper brand (if budget is an issue). You do not have to agree with me on that finding, but would you be able to make an independent recommendation like that as La Bonne Vie is sponsoring you? i do not criticize Lisa for using non-organic cheese. I am criticizing Lisa for not giving any information concerning GMOs and for being contradictory to her own recommendations (see above). Besides that, I do not see a contradiction between eating organic and white bread. The reason why I personally (which again nobody has to share) prefer high-quality cheese on plain white bread is, that whole-grain bread or bread with spices like rosemary, etc. are to heavy/strong tasting for cheese or prosciutto. Good cheese does IMHO not need any distraction. In contrast, for just a slice of bread with butter on it I’d prefer a whole-grain, heavier bread. More generally, I do not know where this US American obsession with whole grain comes from. Some of the thinnest and healthiest countries/cultures in the world – best examples are France and Italy – do traditionally not eat whole grain breads or pasta. Why are US Americans so convinced, that switching to whole grain is going to solve the obesity issue? I don’t understand the obsession with whole grains, either. Dear Critical reader: well said. I appreciate Ms. Leake and you both, but it is good to acknowledge how Ms. Leake might have become biased by corporate sponsorship. This reaffirms my belief that healthy eating is only possible when one maintains a healthy skepticism for corporate food products. I think the recipes look amazing-whatever excuse is used to create them. It’s not like you can’t use your favorite brie should you decide to make one. And no, Brie doesn’t need a recipe, but it’s nice to shake things up every once in a while. Personally I like that the website provides a wealth of information and optional resources. As a critical reader I then choose what to use and when to make substitutions. Lisa provides information for people making a variety of decisions for a variety of reasons-it’s up to me to decide which parts apply to me. Unnecessary negativity is a pet peeve of mine. First off, how could youdo this to me??? Before clicking on this post, I was only a little hungry. After reading these recipes, now I am insanely hungry! My gosh, do these look good. It is frustrating! Which is even more so now because as I’m trying to finish what I was saying, it wouldn’t let me move forward. It simply kept bouncing all over the place! I love your site, but I shouldn’t leave it being ready to pull my hair out! I want to be able to participate, too!! Just need to defend your website – love your common sense approach to eliminating processed foods from our diets. You offer delightful recipes and if someone is inclined to feel your site isn’t offering what they want, they should unsubscribe and establish their own blog. I love your positive attitude and enjoy reading all the information posted. Negative reviews that don’t add to the conversation have no place here. A more positive approach to the criticism of the brie sponsor would have been to offer known organic brie brands to be used as substitutes. I appreciate the need for sponsors. I really appreciate that this blog is so upfront about their sponsors. I don’t want to have to second guess if a link is really a link or an advert. Thanks for the awesome job you do on this blog. Cheese is my favorite food. I love the idea of using brie in a veggie casserole! Thanks for the recipes. The sandwich sounds yummy. Even better with a little applegate smoked turkey. Our favorite brie panini is applegate roast beef with apricot preserves. Goat cheese is also good on cold sandwiches as a substitution for mayo or mustard. A crusty roll with some turkey, arugula or baby spinach and a little goat cheese makes a great sandwich for a summer picnic. (I rarely buy lunchmeat, so sandwiches are a big treat) I too love good cheese! Sadly, with three young kids, my cheese budget usually goes towards staple cheeses like: cheese sticks for lunches, white cheddar for mac & cheese, mozzarella, fresh parmesan, etc. Hi: I never know where to shop for good cheese. Are the cheeses you use available at large food store chains or specialty shops? Any info on where to find the above cheeses in the Chicago area are greatly appreciated. Thanks! The cheese stands alone, pastoral. I’ve been making a sandwich like that for a few years. It’s also very good with some raspberry jam or cranberry sauce spread on it. Lisa & 100 Days team! These recipes look fantastic. Thank you for sharing them. I have made brie and apple grilled sandwiches before, but I like the twist of an apple chutney (which I never, yes, never, would have come up with on my own). Also, I am totally excited to try the roasted winter vegetable casserole. I’m thinking about adding some butternut squash since I have an bundance right now. :-) Thank you so much! Just made the brie and roasted winter vegetable casserole last night, and it was absolutely delicious! I can’t wait to eat the leftovers for lunch. We are trying the sandwiches tonight with broccoli and cheese soup. I would like to make the apply chutney part of the Brie sandwich for my mom so she can keep it in the freezer and make this DELISH recipe whenever she wants. Do you think it’s freezable? I made a sad attempt at a brie and apple sandwich with caramelized onions today and then I saw this recipe. How do you get the brie to spread? Or should I just slice it. I don’t normally cook with brie but have always enjoyed it at restaurants. Thanks for this blog and all of the information. I am new to eating real food and so I really appreciate all of the efforts that go into making this site and also the fact that it is free. I do try to purchase organic ingredients but that is not always feasible. I will at least try to purchase from a local shop when possible, but I do appreciate hearing feedback on brand items. These are usually available in many stores I shop and without feedback I wouldn’t know which one to buy. Thanks so much! Another use for brie or goat cheese is to place it on a tortilla with sliced apples, put it in a non-stick pan and make a quesadilla. Drizzle with a bit of honey. To die for. I made the grilled cheese last night and it was FANTASTIC! I used Sweet Grass Dairy’s brie (a Georgia farm that appears monthly at my farmer’s market in Jacksonville, FL. Thanks! I just made this and it is seriously might be the most delicious thing that has ever come out of my kitchen! Thanks!!! I love these sandwiches! Made them last night and my husband and I were dying they were so good! Bought a wonderful whole wheat bread at bread smith in Edina mn and it was perfect! And great note on the cheese – we really liked! We are cheese snobs and only buy triple cream Brie but the goats Brie was very tasty and melts great! My kids took a bite and they were not as thrilled as we were! This challenge will be way harder for them than us!!! Thanks and loving your recipes!!! Purchased two, eight ounce packages of La Bonne Vie at one of the local grocery stores. Was looking for a few ideas for recipes, despite doing quite a bit of cooking and a bit of recipe development. Could not miss the comments from CRITICAL READER and like some of the other readers, felt you explained your viewpoint in a clear, but polite way. While some may understand her critical response, I live in a small town of 25,000 people and the grocery stores are FULL of processed food. Trying to buy organic in my area is quite limited and expensive. For me, the happy medium is purchasing whole foods and some organic when it fits in the budget. As a health care professional, I can see the improtance of organic foods, but in these economically challenged times it is hard to pay for health insurance, let alone a full organic diet. I just found this and want to thank you for all your hard work. I just made the apple and brie sandwich (using goat brie because it has a less salty taste) and it was amazing. I can’t believe some of the negative comments, and it actually isn’t fair to say that brie doesn’t “need” a recipe. While pregnant, you aren’t advised to eat soft cheeses, and I CRAVED brie when I was. I could have heated one of these in the oven to make sure the temp was high enough and been a much happier pregnant lady! Made the casserole last night. I only used 1/2c whipping cream and the dish was still very rich. Good fall dish, but it was okay. The best part was the browned brie…yum! But there was something off-putting to me that I couldn’t put my finger on…maybe the parsnips? 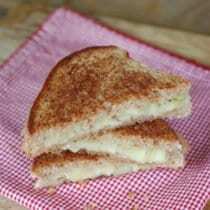 I am trying the brie and apple sandwiches this week…a classy twist to grilled cheese. I just made the brie/apple sandwiches and they were awesome! I paired it with a walnut/gorgonzola salad and white wine-perfect dinner! Could you freeze the brie and roasted winter veggies casserole? The casserole was absolutely amazing! Huge hit with my kids!! I’m going to try the casserole tonight but the name is somewhat misleading.. roasted? Maybe I’m wrong but I think of roasted vegetables as being cooked uncovered in the oven so that they begin to caramelize. This recipe first calls for boiling the root vegetables, sauteeing the leeks and garlic, and then baking everything in the oven. super yummy. I used a little less cheese and heavy cream than called for just to cut down on fat a bit, but it would be even better with more, of course! I would say that it would also be good with other kinds of cheeses (cheddar?). Actually Kristine. I am making the recipe tonight and googled celeriac. It looks like a big white ball and looks like it’s the actual root below the celery you normally find in the store. Check out the picture on Wikipedia. I hasn’t realized this and bought regular celery. Not sure if it will taste the same. 100 days of real food: what’s a good substitute for celeriac? Just regular celery stalks? Can you make the Apple “chutney” ahead of time and store in the fridge for a few days? I just made the brie and apple chutney sandwich and it was delicious!! I added some prosciutto and organic arugula to the sandwich and it added a nice earthy, salty taste to the sweetness and creaminess of the apples and cheese. It is a nice adult substitute for just an ordinary grilled-cheese sandwich. Love it! I wanted to try the vegetable casserole because I’ve never fallen in love with a recipe that included parsnips or celery root. Well, now I have! This was delicious. My toddler wouldn’t try it (tonight anyway. Who knows about tomorrow?! ), but my husband and I both loved it. I made the recipe as written with the exception of the cheese. I used a more locally produce brie. We eat vegetarian for many of our meals but I will add that this definitely eats more like a side rather than a veggie main. Thanks for the recipe!